This chapter explores the power of spirituality as a driving force behind the process of civil resistance of the Lenca people of western Honduras against a World-Bank-financed project to build a hydroelectric dam on their sacred river. It looks at the key role played by environmental activist Berta Cáceres in successfully organizing the Lenca community through her organization, the Council of Popular and Indigenous Organizations of Honduras (COPINH), to resist the dam project. 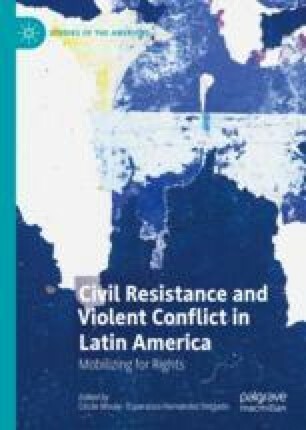 It also examines the achievements of the Lenca’s civil resistance campaign, which eventually led to the withdrawal of the World Bank and the Chinese Sinohydro company, the largest hydroelectric company in the world, in 2013. Arévalo, Nancy. 2018, March 2. Once frases por las que Berta Cáceres no se murió, se multiplicó. Once Noticias. http://www.oncenoticias.hn/once-frases-ambientalista-berta-caceres/. Bank Track. 2013, September 13. Indigenous Protest Against Agua Zarca Dam in Honduras Criminalised. https://www.banktrack.org/news/indigenous_protest_against_agua_zarca_dam_in_honduras_criminalised. Bell, Beverly. 2016, March 10. The Life and Legacy of Berta Cáceres. Democracy Now! https://www.democracynow.org/2016/3/10/the_life_and_legacy_of_bertatext. Cáceres, Berta. 2015, April 20. Goldman Environmental Prize Acceptance Speech. San Francisco. https://www.goldmanprize.org/recipient/berta-caceres/. Castro, Gustavo, en entrevista. 2016, September 1. En el Asesinato de Berta Cáceres están implicados funcionarios del Gobierno de Honduras. elidario.es. https://www.eldiario.es/desalambre/unico-testigo-asesinato-Berta-Caceres_0_554344655.html. Causa Justa, con Piedad Córdoba. 2014. Ríos Sagrados. Honduras: Telesur/Terco Productions. https://www.youtube.com/watch?v=bCUplaaWL6Q. Civic Council of Indigenous and Popular Organizations of Honduras—COPINH. 2018. https://www.copinh.org. Gibler, John. 2017, June 15. Under the Gun: An Investigation into the Murder of Berta Cáceres. Sierra. https://www.sierraclub.org/sierra/2017-4-july-august/feature/under-gun-investigation-murder-berta-c-ceres. Global Witness. 2017, January 31. Honduras: The Deadliest Country in the World for Environmental Activism. https://www.globalwitness.org/en/campaigns/environmental-activists/honduras-deadliest-country-world-environmental-activism/. Lara, Karla. 2013. Que corra el río. [Music Video and Accompanying Texts]. Honduras: Terco Productions. https://vimeo.com/118658277. ———. 2016. Una Canción De Amor. [Music Video]. Honduras: Entrepbs/Herriarte. https://vimeo.com/162504336. Pañuelos en Rebeldía. 2016. Las Revoluciones de Bertha Cáceres. [Video Documentary]. Buenos Aires, Argentina: Cine Mascaró. https://www.youtube.com/watch?v=K0zK2NvwB2A. Radio Progreso, ERIC-SJ. 2016. Guardiana de los Ríos. [Video Documentary]. https://www.youtube.com/watch?v=Lwwe4MOGfmo (Progreso, Honduras: Campaña Madre Tierra. Tejemedios. 2016. Berta no se murió, se multiplicó. [Video]. Honduras. https://www.youtube.com/watch?v=mlNrqoklC_s. York, Steve. 1999. A Force More Powerful. [Documentary]. https://vimeo.com/112189700. Zunes, Stephen, Hardy Merriam, and Maria Stephan. 2017. Nonviolent Struggle. In The International Studies Encyclopedia, ed. Robert A. Denemark and Renée Marlin-Bennett. Wiley-Blackwell. http://www.oxfordreference.com/10.1093/acref/9780191842665.